One of the most straightforward ways to introduce a royal aura into your wedding day is to book your venue for a date on which a royal couple tied the knot. 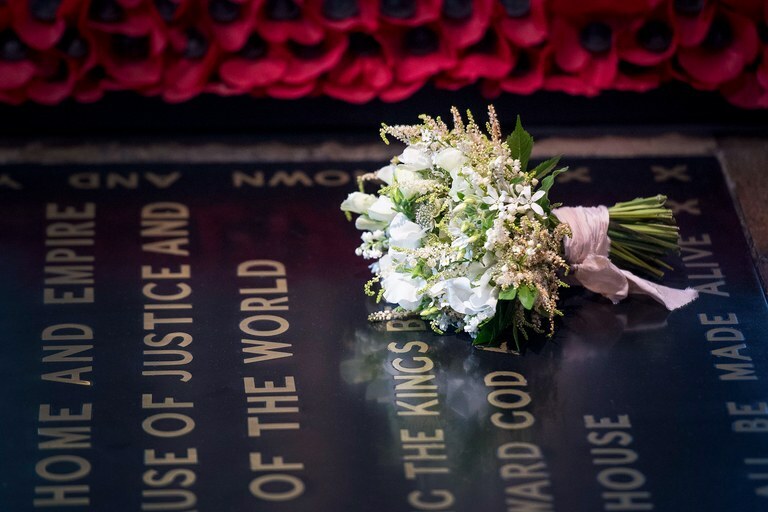 Some famous options: February 10 (Queen Victoria and Prince Albert), November 20 (Queen Elizabeth and Prince Philip), April 29 (William and Kate), May 19 (Harry and Meghan), etc. For a more complete list of options, click here. 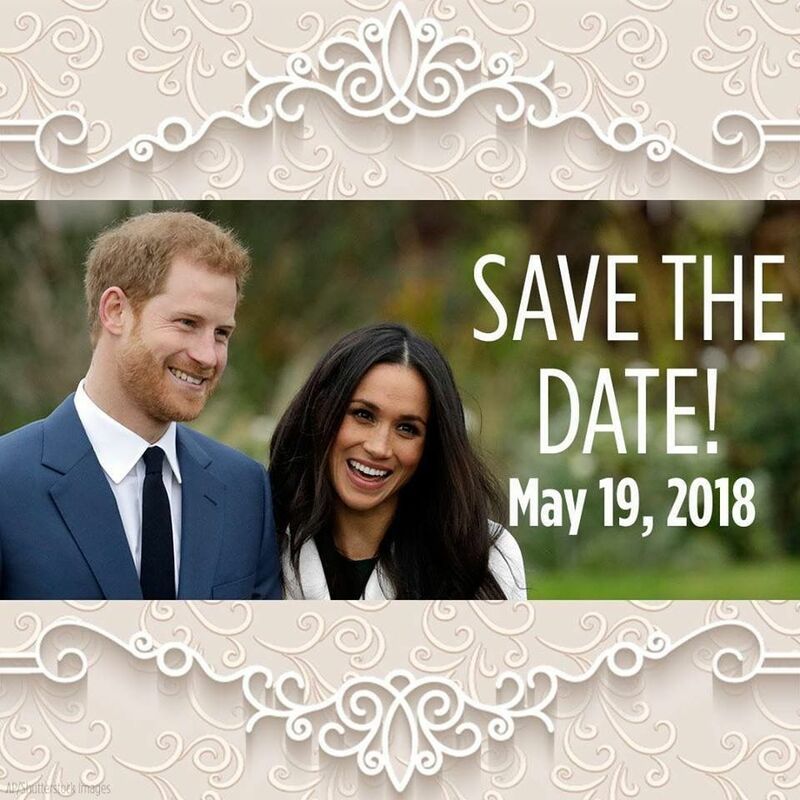 Royal wedding invitations are known for their classic, formal, and elegant style. Tips for achieving that feel with your own stationary pieces include opting for sophisticated colors such as white, black, cream, and gold; designing a personalized emblem, monogram or wax seal; choosing luxurious hand-made paper and ornate, calligraphy-inspired script for the font; or applying rich gold leaf touches. 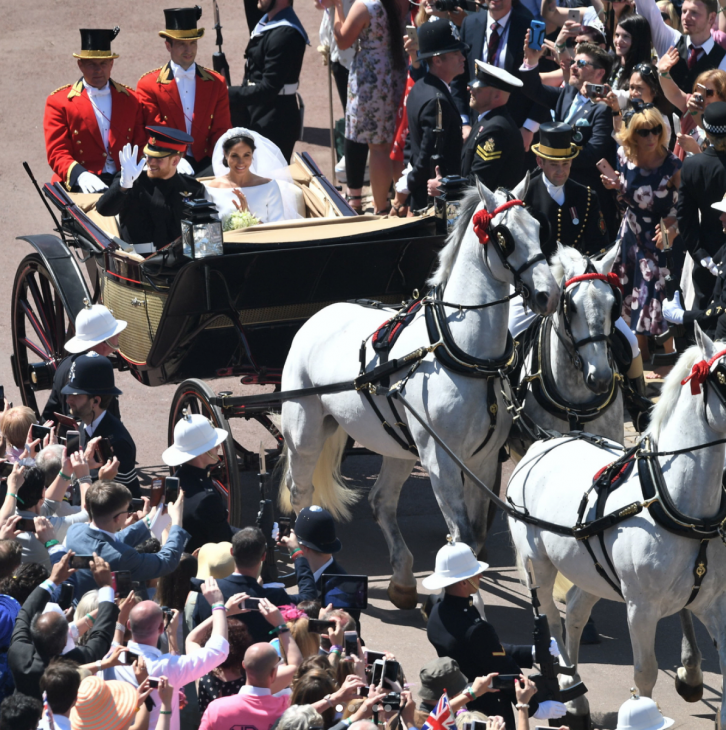 One particular convention is sure to give you that perfect Cinderella moment: a grand entrance or exit in an elaborate coach drawn by a team of horses. Instead of hiring a limo, fancy car, or trolley, book a carriage service to transport you to or from your ceremony or reception site – it will be sure to create a stunning impression and memorable photos. 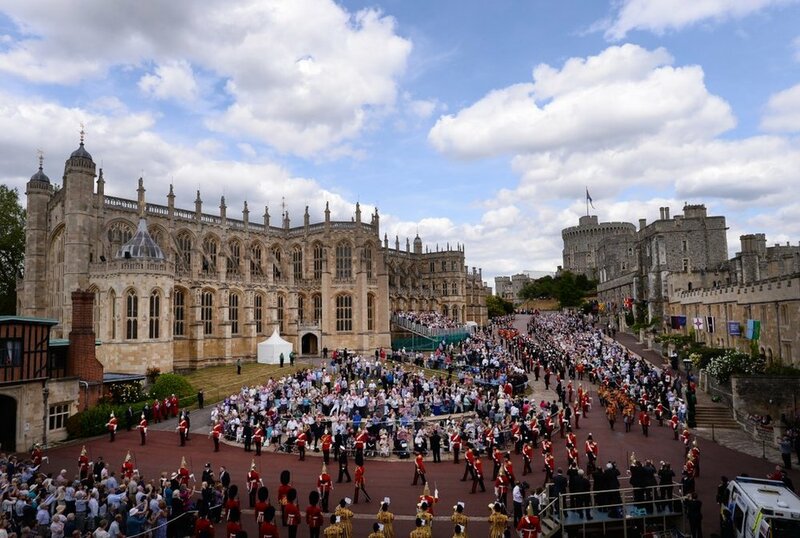 You may not have admission to Windsor Castle, Buckingham Palace, or Westminster Abbey, but there are ways to find or fashion a setting with a royal, even medieval, atmosphere. Search for venues such as old churches, Gothic style chapels, and extravagant stone mansions and estates that have a castle-like quality. Decorating with fine artwork, opulent fabrics, crystal chandeliers, and fine china and silver will also lend your space some regality. No royal wedding would be complete without some classic elements of the royal bridal “look.” While there is no one way to look and feel like a princess, there are a few tips that can really give that fairytale appearance an extra boost. First, ever since Queen Victoria’s magnificent white wedding gown in 1840, royal brides have always worn the color white. Traditionally, these dresses present a refined, classy image, with modest, often higher-cut necklines and collars, long graceful sleeves, and touches of intricate lace. Click here for some Meghan Markle look-a-like gowns you can buy! For a truly statement-making, royalty-worthy gown, a long train and veil is a must (the longest have reached up to 25 feet!! ), and of course, a sparkling tiara or crown headpiece to top it off. Finally, to add a last subtly meaningful touch, have your nails done in a delicate, natural hue as expected of royal ladies, perhaps in a shade of Essie’s Ballet Slippers – reportedly the only polish that Queen Elizabeth wears. Another trend set by Queen Victoria for subsequent royal brides was to carry a sprig of myrtle down the aisle, often in a bouquet of other various white flowers. Myrtle has traditionally symbolized love, prosperity, and good fortune in marriage – the perfect floral choice for any wedding day. For a fun touch, invite your guests to partake in the “royal look” of the wedding too. For the ceremony, customary forms of attire for men include military uniforms, morning coats with tails and top hats, or lounge suits, which are standard tailored business suits. For ladies, modest day dresses are in order along with the unforgettable hats and fascinators. For the reception, guests can come decked out in all their black tie finery – tuxedos and full-length gowns. One mega-cute royal wedding tradition is giving young children a large role in the ceremony. 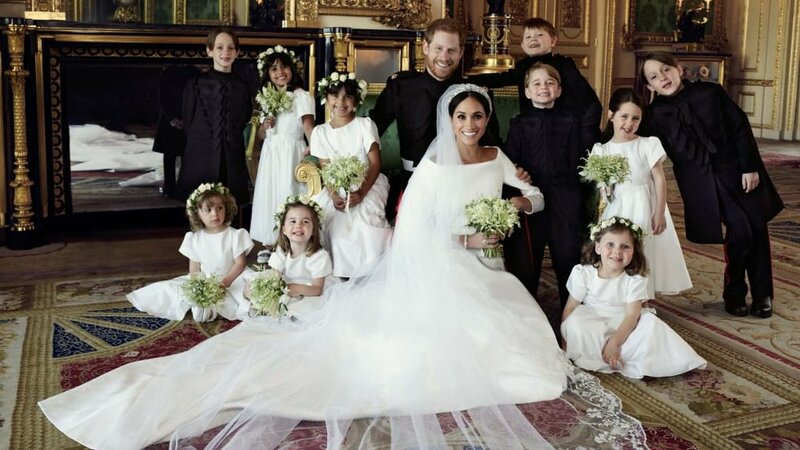 Harry and Meghan had 10 boys and girls, all aged 7 or younger, in their wedding party. Nieces, nephews, godchildren, cousins, friends’ kids, or your own kids can be assigned as flower girls, young bridesmaids, ring bearers, and pageboys to accompany you down the aisle. Although little ones can be unpredictable at times, involving them in your big event could turn out to be one of the sweetest and most cherished moments you have. 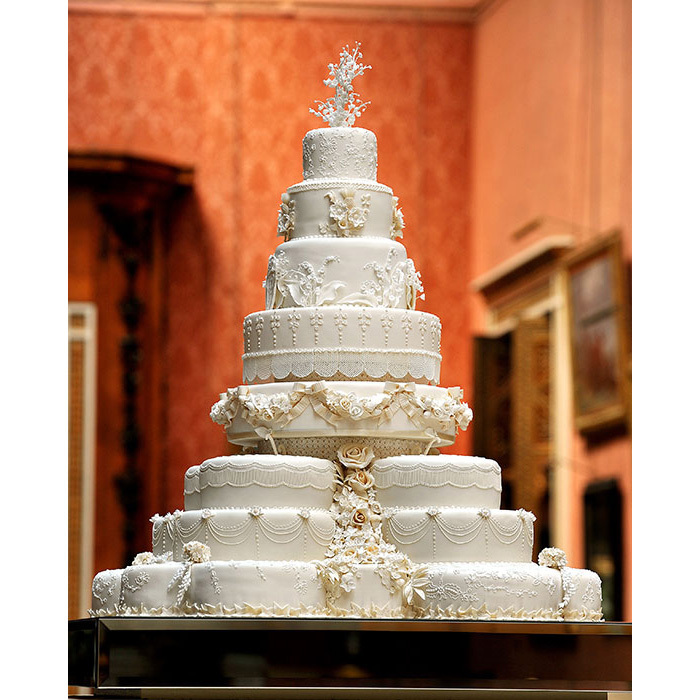 Did you know that even the royal wedding cake is steeped in tradition? First and foremost, rich, dense fruitcake is the established flavor of choice in the royal family (Harry and Meghan are one of the first couples to skip this with their lemon-elderflower cake). The cakes are usually massive, reaching several feet high with multiple tiers, and may be decorated with intricate piping designs, the couple’s emblem or monogram, or exquisite blooms. One funny royal tradition surrounding the cake is mailing out slices to those who could not attend the wedding as well as to thank those who did come. While shipping out cake by post may not be easily feasible, a delightful way to incorporate this idea into your own event is to package up individual pieces of cake in little boxes to send home with your guests as unique, decidedly-royal reception favors. The classic components of the age-old English saying: Something old, something new, something borrowed, something blue, and a silver sixpence in her shoe. Although the most recent royal brides, Kate and Meghan, added some modern twists on other traditions, they both embraced these timelessly popular good luck charms. Meghan combined new bridal fashion and jewelry with some old and borrowed pieces such as her tiara from Queen Elizabeth’s collection. She also added touches of blue throughout her day with forget-me-nots in her bouquet, an aquamarine ring, blue soles on her shoes, and a silver-blue Jaguar to ride in to the reception. Find some distinctive ways to make this custom deeply meaningful and personal to you!